My new neighborhood holds a number of dining gems, and so far I haven’t needed to venture outside of the borders of Riverside/Avondale in order to find memorable, top-notch restaurants. Lucky for me, one of these gems – 13 Gypsies – is literally around the corner from my place and caters to local Riversiders like me. Clicking through the 13 Gypsies website is like flipping through a friend’s old family photo album. A nostalgia for the “peasant” food remembered from a childhood in Spain combined with a desire to provide a high-quality neighborhood restaurant in his Jacksonville home has allowed Chef Howard to create a restaurant with a clear vision. With only seven tables seating a maximum of 18 diners, 13G is true to the model of a European neighborhood bistro and allows the Chef to maintain total control over each dish that is put out. He even prepares many items like breads, sausages, and cheeses in-house and shares his techniques on the 13G blog. The focused menu looks back to classic flavors and traditionally prepared dishes that stay true to their origins, as opposed to a modern trend that Chef Howard believes often unnecessarily melds different styles and culinary histories. As diners, we are led on a gastronomic ramble through the “gypsy migratory trail”: out of India and through central Europe, Italy, France, Spain, and northern Africa. All this, right in our own backyard. 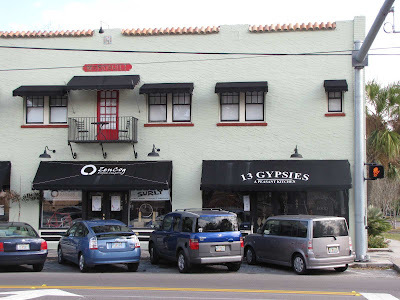 13 Gypsies is open for both lunch and dinner, and the diverse menu affords a variety of meal arrangements. For lunch, any diner could find something that suits him from the pressed sandwich or salad options, such as the double cow sandwich with angus roast beef, caramelized onions, and fontina cheese or the Cordoba salad of mixed greens, queso blanco, sautéed mushrooms, oranges, and sliced almonds dressed with a balsamic vinaigrette. 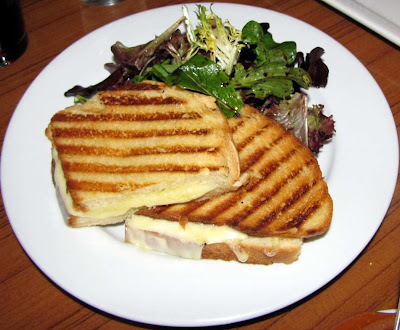 At a recent dinner, I sampled the 13G grilled three-cheese sandwich. It came with a simple side salad of mixed greens and would make a very substantial (and deliciously gooey!) lunch. But the star of the menu really is the selection of exotic and creative tapas. With more than twenty choices, many of them vegetarian and many changing daily based on market availability or the chef’s inspiration, 13 Gypsies can easily satisfy any diner, including repeat customers (of which I will certainly become!). The other day my dining party ordered the honey garlic hummus as we chatted away and decided on the rest of our dishes. 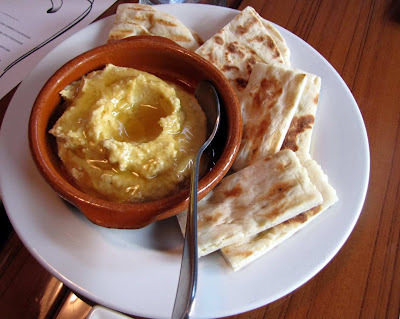 The hummus was blended with garlic, generously drizzled with honey, and served in a clay cazuela with warm flatbread. Who knew that honey and hummus go together like peas and carrots?! A brilliant combination. For those who have never tried Roman gnocchi, the ones at 13G will come as a revelation. You don’t see many eateries in the States offering this simple yet substantial crowd-pleaser. Instead of being formed from potato dough into little lumpy boiled carb dumplings, gnocchi made in the Roman style begin with a loose, runny “dough” of semolina flour, milk, parmesan, and sometimes butter – it’s a mixture that resembles very smooth and buttery grits or polenta. The dough is then spread out flat to cool, then cut into circles or squares and baked or broiled in a creamy sauce. The result is a paradox: light-as-a-cloud texture yet impossibly luscious and rich taste. 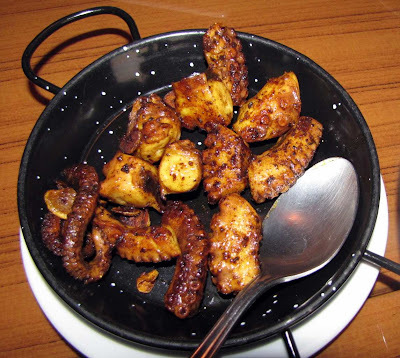 (You can read about the Roman gnocchi I ate in Rome here.) The version at 13G was prepared a bit differently than what I make at home. 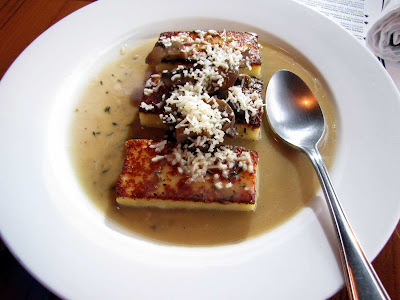 It seemed that the chef had griddled or pan-fried the gnocchi, caramelizing the butter and parmesan and forming a crisp and salty outer layer that resulted in sturdy gnocchi “fingers.” They were served with a perfectly complementary mushroom sauce. You must try this dish! 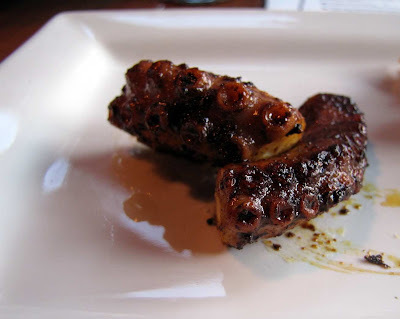 Another must-try is the octopus, blackened with the chef’s own spicy spice blend. Octopus can sometimes end up chewy, but these tender little morsels easily yielded to my knife. 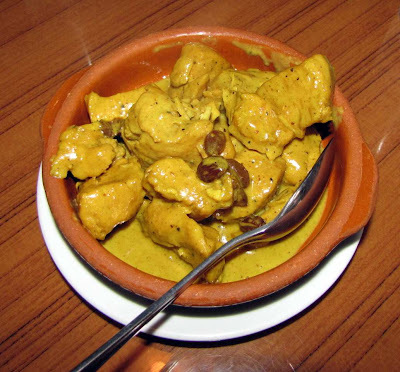 We also tried the coconut mango curry chicken – bite-sized pieces of chicken breast cooked in a coconut milk and mango sauce, flavored with curry and raisins. The dish was perfectly spiced and the raisins provided a welcome sweet note. A fellow diner ordered the angry bull - pan seared beef in a pool of paprika sauce, topped with crushed raw garlic and tiny peppercorns. 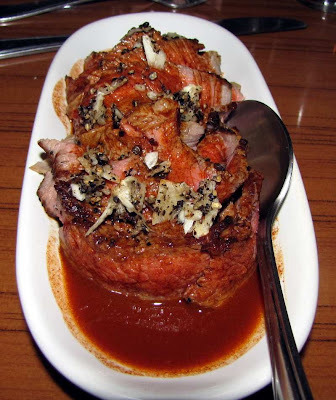 The beef was well cooked and happily rested and stood up well to the pungent garlic and heat-packed peppercorns. It certainly didn’t make us angry, although we did think there may have been just a tad too much paprika in the sauce. Out of the generosity of his soul, Chef Howard graced our table with a complimentary plate of the risotto of the day. It was flavored with bacon and parmesan and finished with cream, and if that doesn’t make your mouth water then you have no business reading a food blog. This truly was one of the best risottos I have ever eaten (even better than the risotta alla Milanese I had in Milan!) 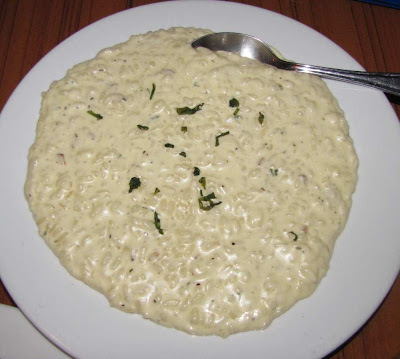 – creamy and smooth and well-seasoned with perfectly al dente grains of rice. The risotto offering changes daily, and our server said no matter what the ingredients, it’s usually her favorite item on the menu. Chef promised he would do a post on the 13G blog on his risotto technique so we can try to replicate this at home. But you really must stop by the restaurant and have the real deal. All wines on the well-chosen list hail from Spain, and many are offered by the glass. My go-to Spanish choice is a Rioja (creative, I know), and they were out of the one I wanted to try. The knowledgeable server recommended the Dehesa de Rubiales Alaia, a blend of prieto picudo, tempranillo, and merlot grapes (if I remember correctly, it was a 2005 vintage). Even though the food might be considered “fancy” by some, there are no big egos at 13G and the dining experience is utterly accessible. Chef Howard is excited about the food he puts out, and wants you to be excited about it, too. One of the less adventurous diners in our party initially expressed a fear to try the scary-looking octopus, but one bite and she was sold. 1 visit to 13 Gypsies and you too will be swept away. Another wonderful review with enticing pictures. One of our very favorite restaurants in the world, and a place we will miss if we leave Jacksonville. I find it puzzling and/or depressing that most of the other diners who are there whenever we visit 13G seem utterly nonplussed by the food. They either pick listlessly at their plates, or shovel in a sandwich and leave. It is obviously a devoted coterie of true foodies that keep this place going, and prevent me from getting a table on a Saturday night! This was one of the best meals I've had in Jacksonville- the food and the company were both outstanding! I finally made it here last night to sample their revised menu -- absolutely terrific, particularly the Shrimp Piri-Piri and the Curried Cauliflower. I was sorry to see the flank steak skewers removed from the menu but so many great additions especially vegetarian ones. I'm actually heading there tonight for dinner AGAIN to try some of the risotto everyone's been talking about. Thanks for your good review of this wonderful place - we're in Jax to escape the dreary winter in Oregon, and staying with our daughter - this is one of her favs, and she's taking us there this coming Tues night - Can't wait - I think Chef Howard is one of a disappearing breed -sadly- but I hope I'm wrong. @John - Lucky you, escaping the dreary weather! My parents are coming down from Ohio next week and they say they can't remember the last time they saw the sun. Looks like you went on quite the road trip to get down here! Enjoy your time in Jax, and especially enjoy Chef Howard and 13 Gypsies. I'd love to hear of any other memorable culinary experiences you have in the area.